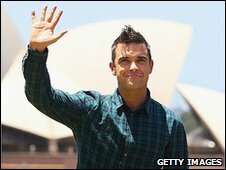 Robbie Williams has said he is not engaged to his girlfriend, despite his mother appearing to confirm the news. Under the heading "Robbie And Ayda: Are They Or Aren't They?" on his official website, Williams simply wrote: "Hey all. We are not engaged. Rob." Speculation began when the singer made an off-the-cuff proposal to Ayda Field on an Australian radio show. His spokesman said it was a joke, but his mother Jan later told BBC 5 live he had been planning to pop the question. After Williams published his denial on Saturday, his spokesman said: "We have no more comment on this apart from to confirm that they are not engaged." On Friday, Mrs Williams told 5 live that her son had revealed his proposal plans to her "a week ago". She said she was "really pleased" for the couple, adding: "I've always wanted a daughter-in-law." Asked when she thought the wedding would be, Mrs Williams said: "I don't think it will be that far in the not-too-distant future, but that's all I'm going to say on that." She added: "I'm very excited. I'm really pleased. They've been together for nearly three years, so it's about time. "She's a great mate, as well as a lover. She's got all the qualities that he needs in a girl. It's a lovely match." Williams had appeared on Australian radio station 2Day FM, where breakfast show host Jackie Henderson told him that Sydney had a reputation for celebrity proposals. Turning to his girlfriend, the 35-year-old said: "Ayda Field, I love you so much. Do you mind being my betrothed for the end of time?" Field, who was in the studio at the time, laughed before saying: "I would love to be your betrothed 'til the end of time." He then borrowed Henderson's frog ring and slipped it onto Field's finger. For the remainder of the show, Williams accepted the congratulations of fans who phoned in to speak to him. But when one caller asked Williams to divulge the last lie he had told, he replied: "I told one this morning. "I mainly just tell people the truth. With the exception of a few white lies here and there." Earlier this month, Williams told Jonathan Ross on his chat show that he thought he was "going to be a bachelor" until he met Field. "I was introduced to Ayda and things just changed. She's a wonderful person and I'm in love. She's really broody and I'm getting there," he said.